In our last post, we wrote about how we are currently working with numerous partners bridging divisions and one of the common questions that partners get concerns the broader impact of their work. Specifically, people who are joining organizations that seek to bridge divisions are less likely to be the ones causing and perpetuating divisions. They likely are people who already have relatively positive impressions of the other side and a sincere desire to get along. However, previous research on extended contact suggests that the effects of these programs may not be limited to those who attend these programs, but also may extend to those who hear about these programs. When people within a group read about members of their group getting along with members of a different group, it can affect their feelings about the other group, without any direct contact taking place. Does this apply to some of the partners we are working with? We recently wrote about how over 90% of members of the Sisterhood of Salaam Shalom tell someone else about their participation and the average person tells 20 others. Indeed, this is an intentional part of the Sisterhood’s model – to have the impact of the Sisterhood extend to the communities in which members are embedded. This is also part of the model of Peace First, an organization that helps youth lead peace-making projects, with the hope that it not only affects the youth, but all the people who read about the youths’ projects. It just so happens that one of the project stories that they promote on their site relates to interfaith cooperation as it shows a Muslim youth working together with another teenager on a project. Does watching the below video affect attitudes toward religious groups? To answer this question, we recruited 740 people from Mechanical Turk to answer questions about their attitudes toward Muslims and Christians. We asked whether they thought each group was generally composed of good people, sincerely wanted what is best for America, and were people they had a lot in common with. We randomly assigned one group of participants to watch the above video before answering questions, in order to experimentally determine the effect of watching such a video. Below are the answers to these questions as a function of whether participants in this study watched or did not watch the above video first. 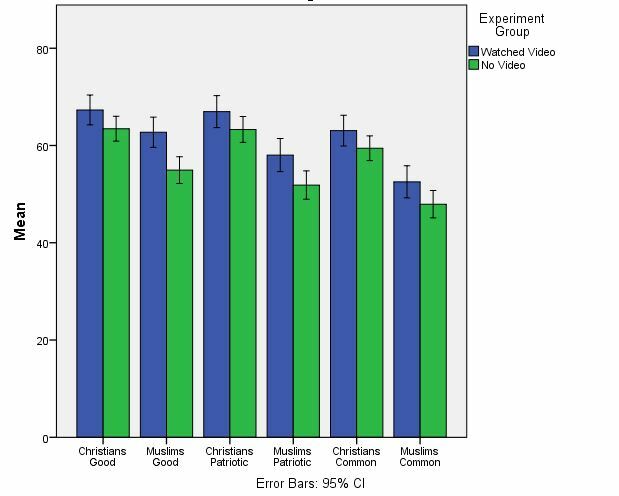 As you can see by the error bars, those who watched the video were significantly more likely to think Muslims (and Christians) were generally good people, were patriotic, and were people they had something in common with. While you’ll notice that people in both groups generally felt more positively toward Christians, the distance between how they felt about Christians and Muslims also shrank for those who watched the video. In summary, as research on extended contact effects would predict, reading about these programs does affect the attitudes of non-participants. Granted that the effects here are small, but it is worth considering that many people who are friends with people doing these programs may hear about the program at a much more personal level and many times over a longer time period. We hope to study those effects longitudinally as well, but we feel like this is a promising start in showing that people who do these programs tell a lot of people about them and then the people that they tell are likely being affected as well. The above is a quote from the executive director of the Sisterhood of Salaam Shalom, an organization that brings together Muslim and Jewish women in friendship, with an eye toward affecting broader attitudes toward members of different faiths. Below is a video that summarizes their work, as well as their theory of change. I have always been struck by how many groups independently come to the realization that the path to bridging divisions lies in building personal relationships first. In a similar vein to The Village Square, Living Room Conversations, Better Angels, and numerous other groups, The Sisterhood of Salaam Shalom intentionally puts friendship at the core of what they do. While there is ample research support for the idea that better relationships among individuals lead to better inter-group attitudes, it is certainly important to verify that these research studies extend to real world settings. As part of our ongoing work in bridging the academic and practitioner divide, we were able to survey 285 members of the Sisterhood to get some evidence as to how research on contact and extended contact effects maps to the real world. Our findings indicate that members do indeed report better inter-group attitudes. As you can see below, most surveyed members self-report that they feel more comfort with others and more dedication to speaking out against divisive rhetoric. 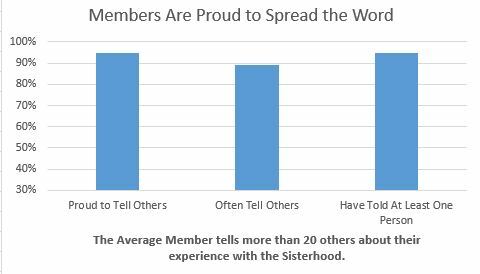 The people who take the survey are a self-selected sample of the membership, so it’s possible that this group is more positive about their experience with the Sisterhood. Another way of looking at whether change is occurring is to examine whether attending more meetings is associated with positive attitudes toward each group. 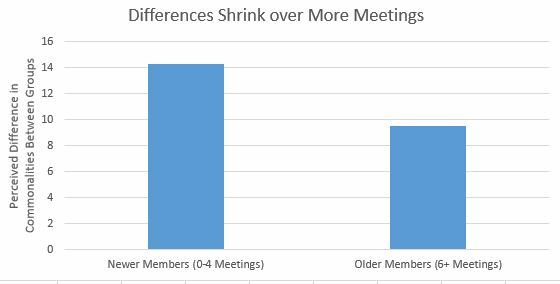 The median number of meetings attended by survey participants was 5, so we examined those who attended 4 or fewer meetings in comparison with those who have attended 6 or more meetings. As you can see in the below graph, people who have attended more meetings report having more in common with members of each faith, as well as more improvement in their comfort with others and greater commitment to speaking out against divisive rhetoric. 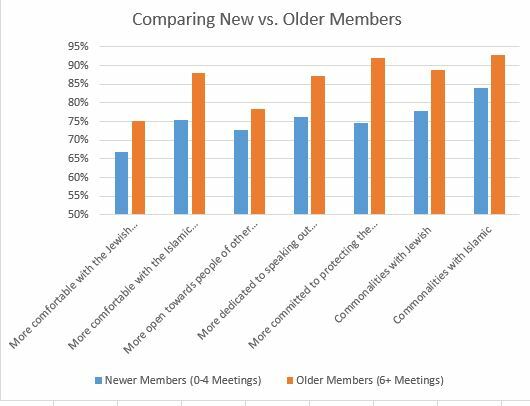 Members who attend more meetings have better inter-group attitudes. Yet another way of looking at the effect of the Sisterhood is to see whether the differences that people perceive in terms of how much they have in common with Jewish or Muslim women shrinks. It is natural for a Jewish woman to believe they have more in common with other Jewish women, as compared to Muslim women, even as one may feel a lot in common with both groups. The same pattern is likely for Muslim women. Yet, as people get to know each other, one would expect this perceived difference to shrink, and the data indicates that it does. Specifically, people who attend more meetings show a smaller difference between their perceptions of how much they have in common between groups. Of course, the people who choose to attend these events are likely not the ones who have extreme attitudes about the other group, so one might question if the Sisterhood is reaching those who most need to be reached. However, research does indicate that those who hear about others making friends across groups also have their attitudes affected (e.g. this work on extended contact effects). While we were not able to survey those who have heard about this work as of yet, we did ask members how much they told others about their experiences. 95% of people had told at least one person and 90% said that they “often” tell others, with 95% being proud to do so. On average, members tell 20 other people, with the median number being 10 and some people telling hundreds of others. As a followup, we are currently doing work examining the experimental effects of hearing about the experiences of members and preliminary evidence indicates that people who read about these kinds of programs experience significantly better inter-group attitudes as well. We plan to follow up with a post on that soon. That being said, it is clear to us that the Sisterhood of Salaam Shalom is not only doing valuable work with a theory of change that is well supported by existing social science work, but also that there is substantial evidence that the Sisterhood is making a measurable impact on both their members and the communities that those members are a part of. ps. If anyone reading this is or knows a Jewish or Muslim woman who would like to join a group or form a chapter, please do get in touch with the Sisterhood directly at https://sosspeace.org/. While the media has been focused mainly on partisan fighting, Donald Trump’s election has prompted a lot of people to reach out across the aisle to understand those they disagreed with in the last election. It may not go reported in the press, but Obama wants Trump to succeed and Democratic House minority leader Pelosi, among others, has been praying for Trump’s success as well. Prominent journalists have been seeking to cross the divide as well, as have organizations we work with, but in this post, I’d like to highlight the many many Americans who have sought to meet people across the aisle. At Civil Politics, we’ve talked with a lot of people seeking to have these conversations and seeking advice and direction. Our main recommendations – focus on relationships and areas of agreement – remain true, but just as we advocate persuading people through intuitive, emotional appeals, sometimes understanding our recommendations is best done by hearing and empathizing with other people’s experiences. Josh Quinn, the owner of Tiger Tree, a boutique store in the town where I was raised – Columbus, Ohio – is one of the many people I’ve talked to lately about convening such a group, and he volunteered to write a bit about his experience, in the hopes that others may be similarly inspired and learn from his experience. Below is his story, along with some answers to followup questions we asked from Civil Politics’ perspective. After consuming literally years of laser focused biased media leading up to this election, I felt like I needed a break to try and find some sense of truth and balance in our democracy. I wanted to at least give myself an honest opportunity to seriously consider positions other than my own; not for the sole purpose of finding their weaknesses, so that I am armed for my rebuttal, but also finding their strengths so that I am better equipped to find common ground and compromise. After expressing my desire to form a non-debate club, a friend turned me onto the work of Jonathan Haidt which lead to Righteous Mind and then Asteroids Club which seemed like exactly what I was starting but without all of the bother of having to actually go and start it. We recently held our first meeting and it was more successful than I could have hoped. I will detail what did and did not work for our group and what we plan to do in the future in the hopes that it will inspire others to follow suit. I served as the liberal moderator and a new friend of mine served as the conservative moderator. I think moderators who can be balanced are a critical link to this working. You need to establish trust in your audience that they are not walking into some sort of biased trap but a safe space to freely discuss and absorb different philosophies. We didn’t actually do much, other than nudge the conversation and hit the reset button twice when things started to heat up. But I think it sends a strong signal to everyone that there are two figures balancing the scales of the conversation and keeping it even. We did begin by having everyone in the circle state their name, occupation and political affiliation. There was some hesitation from folks I told about this but I think it worked great and really helped to strengthen the bridges between us rather than put up barriers. We had only two rules, no rebuttals and no phones. This is a listening exercise that involves some occasional talking, not an argument. I became interested in this idea as a way to better understand people as a means to foster empathy. It has gotten so easy to only listen to ideas we already know we agree with that (I believe) that the distance between our accepted beliefs and opposing beliefs has turned into an often impassable chasm. I may never agree with your position on gun control or climate change or any number of issues but I can possibly empathize with your reasoning for holding a different position. Thus no rebuttals. Participants may ask clarifying questions to help better understand why someone holds a position but they may not offer an attack meant to knock an opponent off base. In turn they may be able to give their reasoning for holding a different position. It is a nuanced distinction but if the group is there for the right reason and the moderators keep things under control it works great. The phone rule was to address how easy it is to google a confirmation of basically any idea that pops into one’s head at this point. In a way I think our critical thinking has become diminished because we have this external biased brain in our pocket to do it for us. Removing phones focuses the conversation to be more authentically of the participants rather than their crowds and I think create some cohesion with the group that would not have existed if a line was still tethering them to their tribes. We ended up with an almost exactly even split politically but, by no design, their makeup was not at all what I would have expected. We had four (not related) liberals from an upper middle class suburb, a conservative that works for a workforce development non profit, a conservative who teaches alternative medicine at a local college, some software folks, a Turkish immigrant businessman, lifelong registered Republicans who campaigned for Hillary or voted third party, and die hard Trump supporters. We had 12 participants which felt pretty perfect to me. I think our extreme (economic, religious and occupational) diversity probably helped people from feeling they had a base to stick to. More than 12 would have lead to people forming teams and putting up barriers. We also sat in a circle completely mixed together. That helped prevent the sort of overheard hushed side comments that can make the tide turn less respectful. I am thrilled that all of our participants want to give this another go. We have even maintained an ongoing conversation on the original event page complete with book and documentary recommendations. The only real difference for our next meeting is that we are sticking to one subject. Last time we meandered through a host of topics, which I think was okay for the initial meeting and kept from scaring off participants that maybe did not feel informed or passionate to show up to a more focused discussion. I would actually recommend that anyone planning a similar discussion pick at least a few topics for the first meeting to let people feel out the concept and drill down from there. People will learn that it’s okay just to show up to listen. It’ not a team sport. There isn’t a winner. You don’t need your teammates also participating. As of now the plan is to meet once a month with the original group or close to it. We’ll likely allow some folks to filter in and out as long as we maintain a balance and stay around 12 participants. I have gotten a lot of positive feedback through Facebook and people stopping into my shop to talk to me about it so I am hoping to help a few other groups get rolling in Columbus as well and do whatever I can to grow this idea. Civil Politics asked: How did you start? Was there any structure to it? If you mean how we started our actually meeting it was by going around the room and introducing who we were and our political affiliation. If you mean the group itself it was a pretty handpicked group of people within my network I thought could handle a civil conversation with people of different political affiliations. I was thrilled to meet my right of center moderator and even when we have disagreed on topics it has never felt divisive. It feels like two friends with a different take on a complex issue which is how I think politics should and can be. The bitterness to which we have become accustomed has been manufactured and can be easily dismantled. Civil Politics asked: Do you feel like you changed your opinions about any issues? Did others? I am not sure I feel like I changed my mind on any specific issues the initial meeting. At least our iteration of this is really meant for learning where the other side is coming from, rather than attempting to sway them to your side. I think some altering or clarification of ones own views is a natural byproduct of doing that but I hope it can remain a byproduct and not a focal point. Civil Politics asked: Do you feel like you changed your opinions about people who differed from you on the issues? Did others change their opinions about others? All around yes. Even as the organizer of an event meant to disintegrate predispositions about people based on their political leanings I was blown away by how much of that happened to me. We had a wonderfully civil discussion involving people across the entire political spectrum. Honestly I had more bones to pick with people on “my” side of the aisle not being receptive to opposing ideas than the other way around. This really solidified my feeling that we have more in common than not and if we just spent more time getting to know each other a lot of our problems perceived problems would be erased. As someone who identifies as left of center I do always feel the need to include the caveat that I understand I say that from a position of privilege. I am a straight, white, male that has been fortunate enough to be successful in business. I feel like I understand as well as I can what those that feel attacked by a certain element of the right are scared of at the moment and I don’t want to delegitimize those fears. But a lot of people on the right are saying “hey that isn’t me at all” so why not listen to them and make allies in your fight against the things that matter to you? I’ve been thinking a lot about this lately in the way that we on the left claim (and I think rightfully so) that in a way the far right is to blame for militant Islamist groups by way of Islamophobia giving fodder to radical clerics to prove that there is a war on their religion that requires a response. Yet we continue to treat the right as if they are a homogeneous group that is only defined by their fringes and then get surprised when they react by grouping together with people or power centers who are closer ideologically, even if they don’t agree with everything that is being said. I’d like to personally thank Josh and all the others who are consciously trying to bridge the divisions that we all see are destructive to our political process and our community. Josh found inspiration in Jon Haidt’s Asteroid’s Club model, but groups like The Village Square, Living Room Conversations, and Essential Partners all have resources that can help you have a positive conversation in your community. Feel free to email me as well (ravi at civil politics dot org) as I’m happy to offer advice and would love to learn about your efforts as well. Truth be told, it isn’t as complex as we academics may make it seem and all that is really required is a willingness to listen and try to form a relationship, rather than convince those who disagree. We’ve been part of many such conversations, and both statistically and anecdotally, people rarely change their mind about issues, but most people walk away with empathy for those they talked with and often, like Josh, a few new friends. While we often study issues related to bridging divisions between liberals and conservatives, there are many issues that aren’t quite as clear cut. We recently studied an event put on by The Village Square concerning the tension between sensitivity to minorities on campus, which sometimes involve limits on what people can express, versus the principle of free speech. Recent controversies at universities like Claremont Mckenna, Yale, and the University of Missouri have highlighted these tensions, with liberals tending to be more in favor of protecting minorities, but also often pitting liberals against fellow liberals. At the beginning of the event, the liberal leaning audience was indeed more implicitly inclined toward people who want to err on the side of sensitivity toward minorities, feeling that such people were more likely to be good people who they would want to be friends with. Knowing this, the organizers of the event were able to recruit a free speech advocate who argued their point from a liberal perspective. From the Village Square’s description of their event. For our Free Speech program we started with a liberal local Rabbi as facilitator who had a very positive relationship with an African American community leader who is beloved locally – and who until recently was a Republican. We knew that Mr. Hobbs had some empathy for both the need to protect minorities and the value of free speech. To complete the panel, we invited Jonathan Rauch of Brookings Institute, who saw the danger of the anti-free speech trends on campus earlier than anyone, originally publishing “Kindly Inquisitors: The New Attacks on Free Thought” in 1993. Rauch argues that the protection of free speech actually protects and advances the cause of minority students – so he makes a liberal argument for a more classically conservative value. Another quality we liked for our panel is that he’s Jewish, so it gave him something deeply in common with our facilitator (to balance the existing positive relationship between the facilitator and Mr. Hobbs). This very high level of pre-existing empathy and cross-cutting relationships made this program quite easy compared to our usual programs, as well as especially enjoyable – though lacked as much tension as some programs do. We always arrange a meeting between panelists ahead of the program. This gives them the opportunity to break bread together and bond as human beings, by the time they’re on stage they feel to all like friends. As we met for breakfast the morning of the program, when one panelist shushed me up because he wanted to hear more details from the other panelists about something, I sat back and said to our facilitator “my work here is done.” We call this whole process leading up to whoever is on our stage as choreography. We think it is central in delivering results. By the time the program begins, much of the fate of the program is “baked in.” In fact, one could reverse these principles to engineer a disaster, or pay no attention to them and throw the results out to luck. Following exposure to Mr. Rauch and the generally friendly discussion between people on opposite sides of the issue, the liberal audience’s opinions about those who emphasize free speech rose to be comparable to opinions about those who emphasize sensitivity to minorities (see the below graph for a pre vs post event comparison). As we have found in previous studies of events, there was little change in people’s attitudes about the issue. The generally liberal audience did not feel any differently about protecting minorities or free speech. However, they did feel differently about those who they may disagree with. 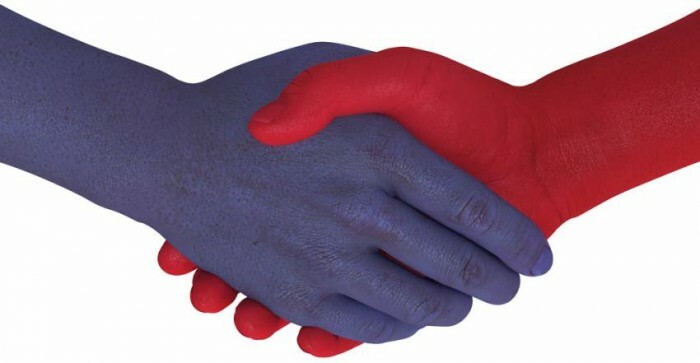 It is this difference that enables people who disagree about issues to work together, and if we can get more friendly conversations across this divide, and get people out of their moral communities, then perhaps we can avoid a repeat of some of the ugly scenes we have seen on college campuses between two groups of people who both have genuinely good intentions.